Judas Priest’s 1984 album Defenders of the Faith has some cool songs, to include Eat Me Alive which was on the PMRC’s list of wicked bad (for you) songs. How silly and fearful people were back then of glorious metal! Where is the PMRC today? Bueller…Bueller…Bueller? Though that song isn’t the subject of one of my favorite cover songs, The Sentinel is. You can find it on Machine Head’s awesome album Unto The Locust (2012 deluxe version). Machine Head, in my opinion, has strung together some seriously quality cover songs (hint for another appearance much later on my list). Those riffs at the beginning of the song belong on a (best of) riff list. Machine Head recorded a spot on cover of the Judas Priest classic. Here is Machine Head’s version found as a bonus track on Unto The Locust. 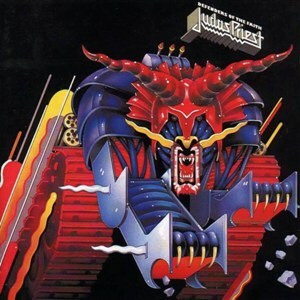 Here is the 1984 original by Judas Priest on the Defenders of the Faith album. Posted on February 11, 2013, in Metal Lists, Reggie's Top 25 Cover Songs and tagged Cover Song, Defenders of teh Faith, Judas Priest, Machine Head, The Sentinel. Bookmark the permalink. 1 Comment.